In the past few years, he’s been on that mission. China has taken a greater role of influence in BRICS, ASEAN, and the Shanghai Cooperation Organization. Its currency is becoming part of the SDR basket. China’s territorial ambitions and environmental focus, plus international respect for China as a viable super power alternative to the U.S., are accelerating, not decelerating — despite what you may be hearing from main stream media reports about its slowing economy. China is playing the long term game and takes domestic and global growth seriously. China will offer more transparency to foreign investors. However, it’s important to keep in mind that neither candidate has the ability to alter how China deals with it’s own currency, grows its presence, or protects itself. But China will choose to be more transparent as part of an effort to seek greater acceptance in the international community. As China becomes more transparent, more investors will notice and put their money there, particularly in bond markets. But right now, foreign investors only account for 3% of China’s bond markets, even though it is the second largest in the world and has outperformed other emerging areas. Beijing now overtakes New York City as the “billionaire capital” of the world. More pertinent to China’s growth prospects is the massive expansion of the middle and upper middle class in China. 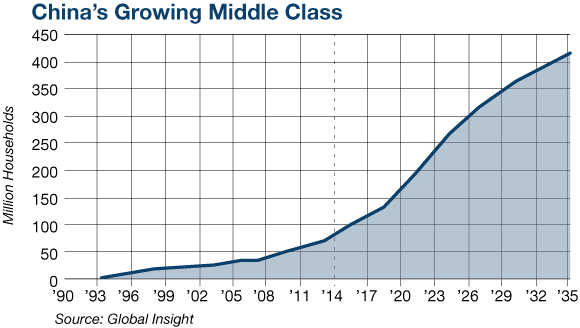 China’s middle class now rivals that of the U.S. in size, and is accelerating rather than decelerating. This growing middle class spent over $215 billion overseas last year alone, more than any other nation — yet less than 5% of the Chinese are passport holders. China wants its population to spend more of their money in China, bettering themselves and their lives, as part of its future growth path. That’s why China is pouring funds into business training and the education of this precious “people’s” commodity. Thanking, rather than antagonizing, China might be good for the U.S. economy. China’s financial systems are expanding, even front-running, economic growth, which is a factor in pinpointing great investments for you. You won’t hear about China’s economic health from the main stream media reports. Yes, shadowy money without productive uses is hard to trace throughout the real economy — in the U.S. and in China — and it incurs leverage building which can be problematic in the future. But the thing is, the Chinese government is well aware of this. Right now, it has a plan for the end of the year to make significant strides in deleveraging infrastructure-related debt and over-capacity. As part of that plan, and its wider 5-year plan for 2016-2020, China is focused on the green, sustainable energy sector. It has become the dominant international force in that space. The other part of the plan is now coming into rapid focus: growing the consumer sector and funding education to produce an even more competitive population on the world stage. Why is this coming to a head in China right now? The reason for the urgency in China’s investment in these sectors is simple. They are taking advantage of the opportunity offered by the triple timing of the G20 in China, the yuan inclusion in the SDR, and the U.S. election — which China believes has caused friction in long-standing political processes in the U.S.